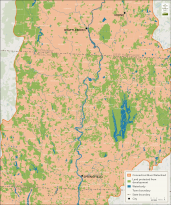 A new map of the the Connecticut River watershed in Massachusetts, southeast Vermont and southwest New Hampshire shows that the vast majority of the farmland and forestland is vulnerable to being converted to houses, roads, parking lots, and Walmart stores and similar commercial buildings. New homes can be created by converting run-down, drafty single-family homes to energy efficient, multi-family housing. In New York City, rich people live in apartments. In the Valley, land trusts have protected much of the land that is safe from so-called "development." Links to local land trusts are at www.FindALandTrust.org. Land trusts get most of their money from the government. Politicians decide whether to invest in saving land and thereby preventing climate change, or to invest in the military, which accounts for 45 percent of the federal budget. Raising taxes on millionaires could provide more funding for saving farmland and forest land. Some town governments invest in land conservation. State governments do too. This map is a Valley Post exclusive. The Valley Post thanks the Trust for Public Land for making the map.